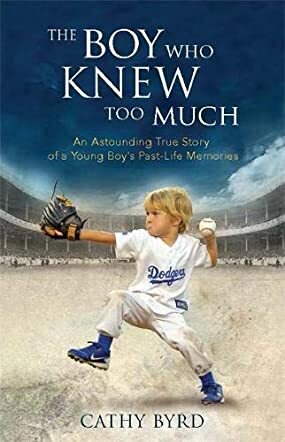 The Boy Who Knew Too Much (An Astounding True Story of A Young Boy's Past-life Memories) by Cathy Byrd is the fascinating account of a toddler who remembers being Lou Gehrig in another lifetime. The two-year-old toddler is totally captivated and immersed in baseball. As a matter of fact, he is totally obsessed with it. He lives in his miniature Dodger's baseball clothes and cleats and refuses to wear anything else. He plays with his small bat and ball from morning until night. When the toddler surprises his mother with the outrageous statement that he is Lou Gehrig, she is stunned. He describes things from the era in which Lou Gehrig lived and gives her personal information about the legendary man of which he nor any small child his age has access. Needing to know if her son is correct, she begins the search into baseball's early history. What she discovers is phenomenal. The Boy Who Knew Too Much (An Astounding True Story of A Young Boy's Past-life Memories) by Cathy Byrd is an extraordinary memoir about a mother's journey into her young son's past-life memories and the amazing discoveries that she makes along the way. Despite the implications and far-fetched nature of her toddler's claims and the fact they were outside of her religious belief system, she was willing to go beyond the accepted standard to get answers. Her dogged determination in seeking and sometimes ferreting out the information needed to validate her son's claim to his former identity is admirable. Her loving concern enabled him to accept who he is and helped him ease into this lifetime. This is an amazing story of how far a mother will go to protect and support her child's mental and spiritual well-being. This is a fabulous memoir, and I highly recommend it to those who have had similar experiences, and most especially to those who love incidents that are not conventional, but of a reality beyond our perceived rationality. This book is a winner!